iPhone by the Numbers: Is it Really King? With the constant buzz around Apple's every iPhone-related movement, you'd think the smartphone was dominating the industry. Revolutionary as it is, that's not the case. A new analysis from The Nielsen Company shows that when choosing a wireless carrier, getting a specific phone is as low on the priority list for U.S. cell phone users as it was before the iPhone's existence. Sure, some people are flocking to AT&T so they can get the iPhone, but most U.S. customers first look for criteria other than phones when shopping for a carrier, Nielsen surveys show. Those criteria were the same in pre-iPhone Q3 2006 and Q1 2009, and include price, family plan, and network quality. That's according to global research from Gartner, who determined that Nokia and Research in Motion still have the upper hand in global smartphone market share. Nokia claimed 41 percent of the market and Blackberry phones claimed 20 percent. Caveat: The data's from May, and Apple did sell 5.2 million iPhones last quarter. The iPhone's App Store may lure buyers with what seems like infinite possibilities, but when it's time to download, iPhone users are just like everyone else. Global research from InStat says the average smartphone owner downloads roughly five software applications. It's easy to forget that the iPhone accounts for just a sliver of the global phone market. ABI Research says Apple's share was 1.5 percent in May. Even as iPhone sales surge on the strength of the new 3GS, it doesn't compare to, say, Samsung, which had 17.8 percent of the market. What excites the tech world is not that the iPhone is king, but that it is rising to power. 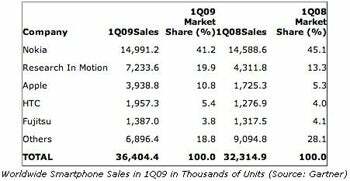 We need some new data that takes into account sales of the iPhone 3GS and the now-$99 3G. And while global market share is low, Apple does plan to expand to 40 countries this month, and 70 countries later this year, provided it can meet demand.